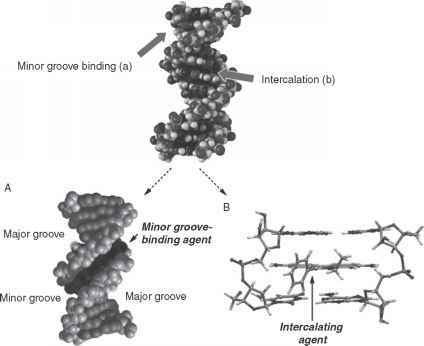 Besides non-specific electrostatic interaction with phosphate groups, there are two main ways in which a molecule can bind to DNA in a reversible way: (a) groove-binding interactions, which do not require conformational changes in DNA and usually shows high sequence specificity; and (b) intercalation of planar or quasi-planar aromatic ring systems between adjacent base pairs, which requires separation of the latter and normally takes place with low sequence specificity (Fig. 6.1). 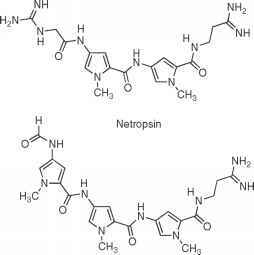 Medicinal Chemistry of Anticancer Drugs © 2008 Elsevier B. V.
DOI: 10.1016/B978-0-444-52824-7.00006-8 All rights reserved. 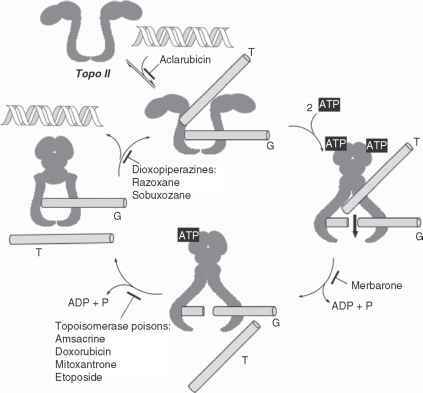 FIGURE 6.1 Main types of reversible interactions with DNA. 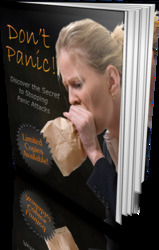 and for this reason many of the compounds studied in this chapter contain several simple aromatic or heteromatic rings linked by torsionally free bonds. The interaction with the minor groove of some antitumor agents has been mentioned in previous chapters (anthracyclines in Section 3, bleomycins in Section 7, and enediynes in Section 8 of Chapter 4). 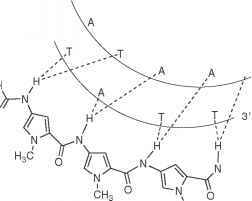 FIGURE 6.2 Adenine-thymine and guanine-cytosine pairs. Hydrogen bonds involve the amido or amidino groups of the drugs as hydrogen donors and the N3 of adenine and C2=O groups of thymine as hydrogen acceptors, as shown in Fig. 6.3 for the case of distamycin A. FIGURE 6.4 Three-centred hydrogen bonds in the distamycin A-DNA interaction. initial expectations, the protonated guanidine or amidine groups do not bind directly to DNA phosphate groups, but line the floor of the minor groove. The synthesis of analogues of distamycin A by increasing the number of N-methylpyrrole-2-carboxamide units or replacement of some pyrrole nucleus by an imidazole, and also by preparation of hybrid structures with intercalating or alkylating portions, has led, in some instances, to much enhanced cyto-toxicity.5 Two of the most promising compounds in this area are tallimustine and brostallicin (PNU-166196).